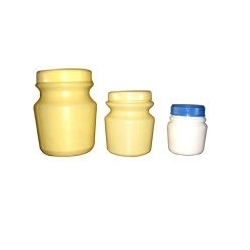 We are a dedicated manufacturer of Small Edible Oil Containers. Our expertise to provide world class plastic containers can be seen in this finely fabricated product. This container does not crack and is made of the best grade of plastic. Besides, the plastic is thick and does not let the oil spill from anywhere in the container. The customer will be definitely be benefited with the quality features and suitable price of this product. We manufacture various types of DAGA brand plastic and related products catering to various segments from lubricants, chemicals, food processing, agriculture, water treatment, paints, building and construction, to industrial, electrical, textile and consumer segment. From manufacturing our standard jerrycanes to delivering precision molded customized plastic products, we have come a long way in the last three decades to get to the success in the industry. From our establishment in 1969 with modest resources, we have today-established a business that generates a huge annual turnover. Plastic Bucket , Plastic jars & Paint Containers.